Legendary archivist PK Nair explains how an element of set design has been used to depict affluence and the ups and downs of characters. PK Nair, founding director of the National Film Archive of India, was a delightful man with a winning smile and a generous heart. But the most striking aspect of his personality was his unrivalled and selfless passion for cinema. In December 2000, I started recording a series of freewheeling interviews with Nair with the idea of turning the conversations into a book. That never happened. On listening again to those poor-quality audio cassettes recently and hearing Nair speak so perceptively, I was sure anyone believing in the art of cinema would enjoy Nair’s fascinating insight into some early classics. For instance, he had some remarkable insights into the use of staircases in Indian cinema, as excerpts from the transcript of our conversation prove. PK Nair: I was always drawn to Hindi cinema. From the fifth standard, I took Hindi as my second language and was very fond of Hindi film songs. In my college years, I used to see three or four films a day. But the film I fell in love with was the 1949 Andaz by Mehboob Khan. Even now, I find it so interesting because it is not a superficial film. It is a profound work in terms of characterisation and use of cinematic language. Apart from the songs and entertainment values of the film, it has so many other layers. Nasreen Munni Kabir: For those who have not seen this black and white classic, the story is about two men, Dilip (Dilip Kumar) and Rajan (Raj Kapoor), who love the same woman, Neena (Nargis). The film starts on a happy note when Dilip falls in love with the very affluent Neena. Unbeknownst to him, however, she is already engaged to Rajan, who is away in London. Neena encourages Dilip but joyful times turn dark when Rajan returns to Bombay and the love triangle has a tragic outcome. Andaz marked a major turning point in Hindi cinema with its sophisticated direction, choice of theme, fabulous performances, superb songs and great dialogue. The film revolves around the complexity of relationships between men and women when tradition clashes with modern ideas. It is one of the most ‘Hollywood’ of Mehboob Khan’s films, reminiscent of a Douglas Sirk melodrama. The sets by Keshav Mistry also play an important role. PKN: Yes, and as we speak, I was thinking how staircases have been used in Indian cinema and the primary example I would choose is Andaz. I don’t know whether Mehboob was conscious of what his set would symbolise, but when you look at the film, the staircase is not merely a bit of set design, but the crucial space where many important scenes take place. For example, the first time we realise Neena is engaged to Rajan, who is returning to India, she comes down the grand staircase with a letter from him, singing “Koi mere dil mein khushi ban ke aaya.” Dilip Kumar enters the house while she is singing and thinks that the song is meant for him. Andaz has many moments of mixed signals – Dilip thinks Neena loves him while she thinks it’s clear she loves another. And quite often the staircase is the backdrop for those scenes. NMK: Hitchcock has used stairs from the very first shot of his first film, The Pleasure Garden, to his last film. He believed a staircase was very photogenic. PKN: And here we have an Indian filmmaker using it so cinematically in a 1949 Hindi film. Andaz can be compared to any film made in the West. We can talk of the spiral staircase in A Streetcar Named Desire, or the grand staircase in Gone With The Wind. Think of the staircase scene when Rhett Butler moves towards Scarlet to hit her and says you will have a miscarriage, and then she loses her balance and falls down the stairs and does have a miscarriage. Stairs and how they are used in cinema have always fascinated me, whether the screen characters are going up or down. In old Indian cinema, the staircase leading down to the living room was a sign of affluence – to show you owned a big enough house to accommodate an indoor staircase. It also divided the public and private spaces. Only the family were received on the upper floors. Like the grand piano, the staircase was shown to symbolise wealth and even aristocracy. You belonged to the upper classes if you had an indoor staircase. Interestingly in Andaz, the staircase is divided into two halves, with a balustrade or half landing in between the two sets of stairs. And if you analyse Neena’s emotional conflict, she is, in fact, divided between the two men in her life. So there are two spaces – Rajan’s space and Dilip’s space. This neutral space, the balustrade, is where a lot of action and dialogue take place between the lovers and links their two worlds. Take, for instance, the scene near the end of the film when Rajan, overcome with jealousy and anger, uses the tennis racket in his hand to hit Dilip on the head. They are both standing on the balustrade of the staircase. Nargis at the top of the staircase, followed by Raj Kapoor and Dilip Kumar in Mehboob Khan’s Andaz (1949). Courtesy Mehboob Productions Pvt Ltd/Hyphen Films Collection. NMK: There’s another great moment constructed around the staircase and I wish someone could have asked the three brilliant actors how many takes that amazing shot took – Rajan and Neena are arguing on the balustrade. When Neena gives Rajan a flower for his lapel, he says it is without scent, and from the balustrade (uncannily like a witness box), Rajan tosses it across the room at the very moment Dilip enters and catches the falling flower, a symbol of Neena’s love. In a single panning shot (from balustrade to doorway), Mehboob visually suggests the entire drama and ups the tension between the three characters. PKN: It is these simple and seemingly little scenes that are so cinematic in presentation – they suggest an understanding of human relationships. Rajan stands on the balustrade that, as you say looks like a witness dock, and points an accusing finger at Neena and later at Dilip. There is no need for dialogue – it’s all in the gesture. You can never forget those moments. They lift the film onto a whole other level. 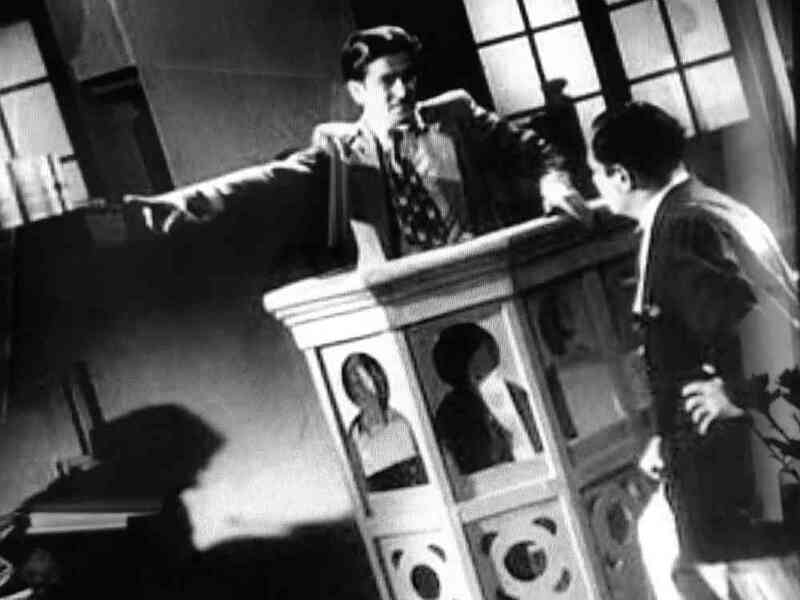 Raj Kapoor in the witness dock in Mehboob Khan’s Andaz (1949). Courtesy Mehboob Productions Pvt Ltd/Hyphen Films Collection. NMK: What about the scenes in Bimal Roy’s Devdas, where in childhood and adulthood, Devdas throws a pebble on the roof of Parvati’s house, she hears the sound and knows it’s a sign that Devdas is waiting for her under the tree opposite her home? She runs down the stairs – these are outdoor stairs on the side of Bengali houses – to join him. In the climax scene, Parvati, who has married a rich man, runs down a flight of stairs inside her husband’s opulent house. She rushes to the closing gate hoping to catch a sight of Devdas’s body as it is being taken away for cremation. What about the stairs in Devdas? PKN: I think the staircase in Devdas is more of a functional thing and not meant to suggest wealth or mean anything specific, whereas in MGR’s Enga Veettu Pillai, the Tamil original of Ram aur Shyam, there is a two-tier staircase symbolising the two heroes that MGR plays. We should ask why some staircases are very narrow while others are split into two sections. Naan Aanai Ittal, Enga Veettu Pillai (1965). NMK: In Pyaasa too, the stairs play an important narrative role. 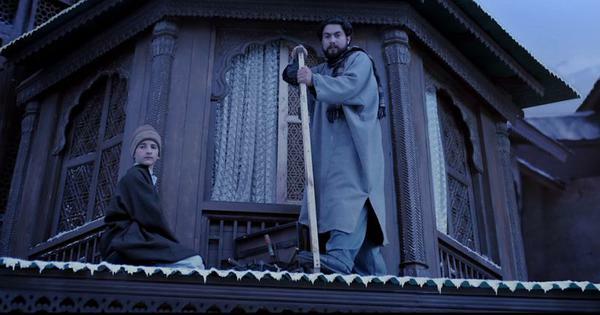 A key dialogue between Vijay and Gulab takes place as they climb the steps to her room. Vijay speaks of his despair and belief that artists are of no value in society. Nearly every time Vijay comes to see Gulab, she is either helping him up the stairs or rushing down to meet him. Even the famous “Aaj sajan mohe ang laga lo” is built around a flight of stairs leading to the roof terrace. Stairs, of course, allow the filmmaker many more interesting angles which having the characters talking on a flat surface does not. PKN: Yes, there’s that. Remember the important role the staircase played in Awaara? There, the staircase winds down from the upper floor to the large living area in one sweep. It is not a two-tier staircase with a balustrade but a one-piece winding staircase – there is no conflict of emotions here. 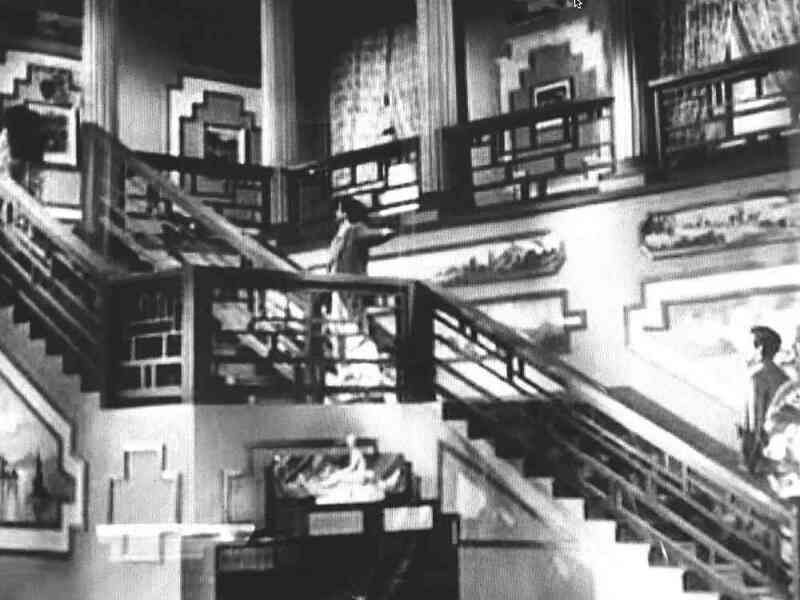 Awaara came two years after Mehboob’s film and was made by Raj Kapoor – he clearly saw how effectively a staircase could be used – so I think the staircase was a direct inspiration from Andaz. In Awaara, the staircase is a sign of great opulence. Awaara’s sets are wonderful and were created by the artist MR Achrekar. The first time we see the interior of Judge Raghunath’s (Prithviraj Kapoor) house, it is through Raj’s eyes. Raj [Raj Kapoor] is a petty crook and lives with his mother in a very modest home. At some point in the story he is chased by the police and runs into Judge Raghunath’s driveway to take refuge in his house. Raj persuades the servant that he is the piano tuner – an assumption that a house like this would most definitely have a piano. The doors of the mansion open, he is taken aback by this decorous and lavish space, he whistles. Raj examines the various objects in the room and sees a lighter that takes his fancy. He pockets it and sits at the piano, playing some tune loudly. 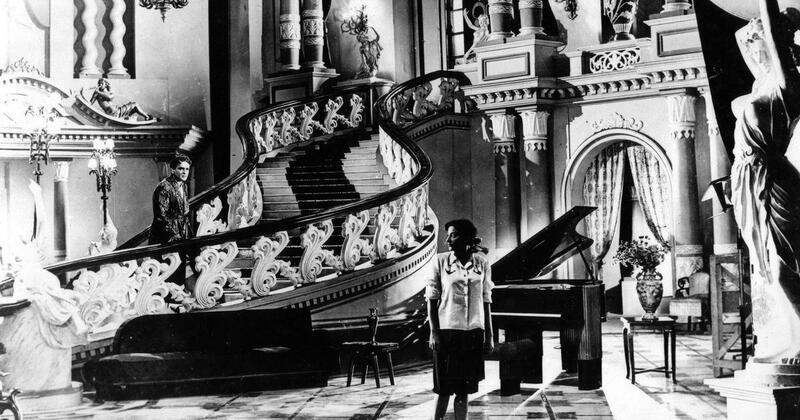 Nargis hears the piano-playing and runs down the stairs annoyed, “Who is tinkering with my piano?” Raj Kapoor recognises her and she him – he quickly slides the stolen lighter onto the floor so it ends up in a corner of the room, as she makes her way down the stairs, delighted to see him again – wonderful scene. 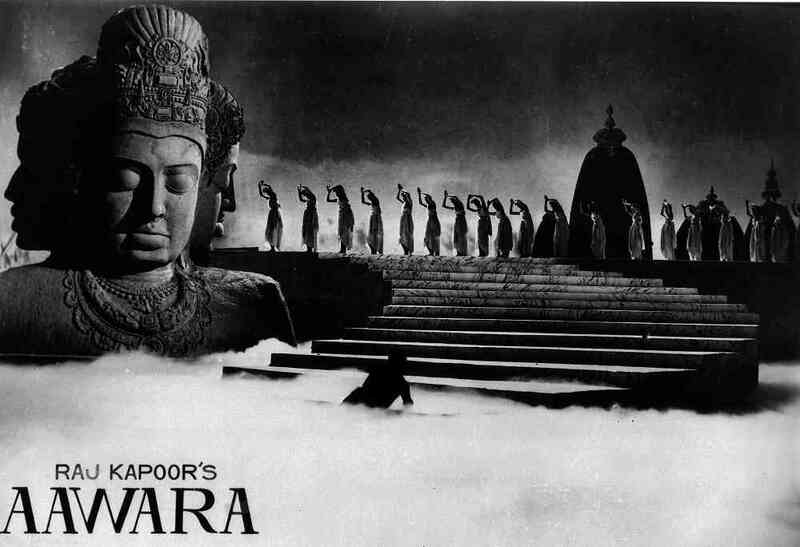 The dream sequence in Raj Kapoor’s Awaara (1951), choreographed by Madame Simkie. Courtesy RandhirKapoor/RK Films/ Hyphen Films Collection. NMK: And then you have Raj Kapoor creating a two-levelled space in the three-part song sequence starting with “Ye nahin ye nahin zindagi” – the dream and the nightmare. As Raj climbs out of the clutches of hell, the first thing he sees as he emerges into a heavenly abode is a gigantic Trimurti and a grand staircase and Nargis running down the steps towards Raj. The staircase here accentuates their class difference and by leading him up the steps – we guess that it is she who will lift him out of poverty and crime. PKN: I don’t know whether filmmakers were conscious of the subtexts they were creating. But it is for us to see. As long you can explain it logically and it works with the narrative – I find it interesting. Some people say you are reading too much into all this – I say I don’t give two hoots for that kind of comment. It’s our job to read the layers in films. 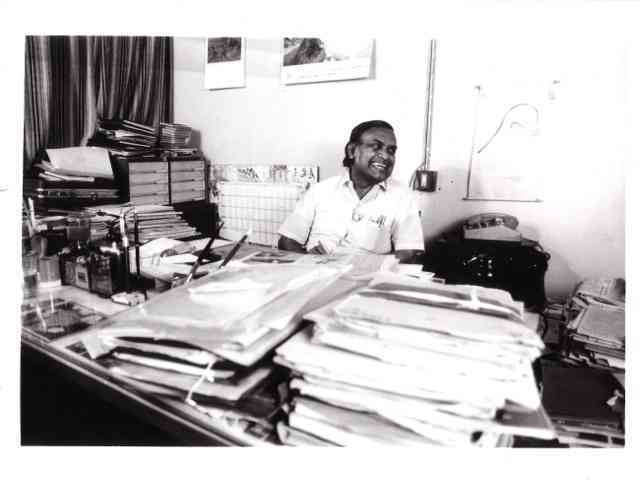 PK Nair at his office at the National Film Archive of India, Pune. 1987. Photograph by Peter Chappell.